‘Walk for Life’ Turnout not Enough for Another People Power Revolution? 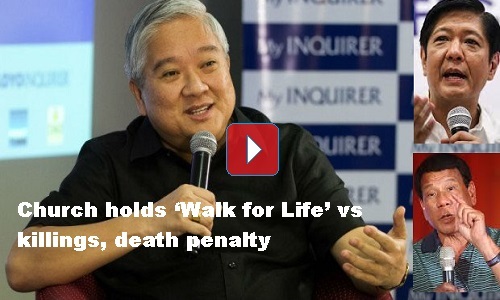 CBCP President and Lingayen-Dagupan Archbishop Socrates Villegas urges Catholic patrons to walk for life. Not with blood, not with dead bodies, but with prayer, with courage to walk to stand up for life. There are thousands of people who participated but not enough to stage another People Power Revolution. [VIDEO]: The president of the Catholic Bishops’ Conference of the Philippines, Archbishop Socrates Villegas, urges Filipinos to join the ‘Walk for Life’ against extrajudicial killings, the death penalty, and other anti-life measures on February 18, 2017, at the Quirino Grandstand. Critics say that the “Walk for Life” event is a way to check if Filipinos are still one with the People Power Revolution in 1986. Although there are thousands of attendees, they are far fewer than what is needed for a revolt. Anti-crime advocates express concern over the possible use of Church money to campaign against the re-imposition of the death penalty. Dante Jimenez, founding chairman of the Volunteers Against Crime and Corruption (VACC), said that there is no way to find out if the donations made by members of the Catholic Church are used to fund the anti-death penalty drive because the church can’t be subject for audit. They don’t pay taxes as well. Villegas, the president of the Catholic Bishops Conference of the Philippines, explains that the prayer rally is for those who can no longer speak due to fear for their lives. It is not to defend drug addicts and killers. Criminals should be arrested, charged, sentenced and jailed to correct their wrongdoings. Guilt should be proven in a court of law, not by the bullet,” he said. Vigilante killings already exist in the Philippines ever since time immemorial. The only difference now is, it’s highly publicized. Not to promote peace but to try to destabilize the government. Even before the president is elected, his critics vow to make him responsible for extra-judicial killings in Davao when he was still a mayor. The ‘Walk of Life’ sad to say is highly political and the church is guilty of supporting the president’s detractors. Next post: Many People Allow Trillanes’ Bluffs to Ruin Binay – Will you Do the Same to the President? With the involvement of the church on questionable issues, people are not easy prey anymore even with the promise of monetary rewards.People would love to see the CBCP for the church only and not meddling on political affairs.They can best serve the people by staying apolitical.